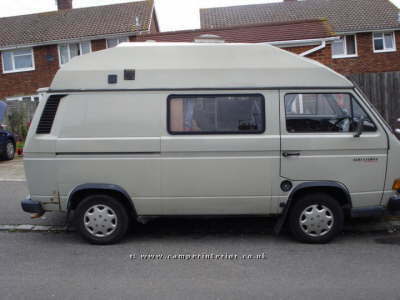 Skells 1985 Volkwagen T25 Autocruiser Diamond RV - This is a rare British conversion which uses the front and mid seats to form beds for two. The sink, cooker and fridge are across the rear bulkhead. Both front seats swivel to face dining table. There is a lot of storage space - a large locker above the cab, It has a shower (yes shower!) cubicle behind the mid seats.